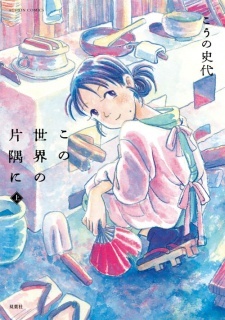 In 2009, Kono Sekai no Katasumi ni received an award of excellence in the 13th Japan Media Arts Festival in manga category. The manga also ranked 1st place in the "The Best Manga 2010: Kono Manga wo Yome!!" (THE BEST MANGA 2010 このマンガを読め！) and "Da capo Tokubetsu Henshuu: Saikou no Hon! 2010" (ダカーポ特別編集 最高の本！2010) in manga category. The series was published in English as In This Corner of the World by Seven Seas Entertainment in a complete omnibus on October 31, 2017. It had previously been digitally published in English by JManga. Kono sekai no katasumi ni is one of that tough stories that touch you deep. With this manga Kouno Fumiyo show us the life of a young woman from Hiroshima during World War II. The story begins with the announcement of the convenience wedding of the main character, Suzu, with a man from Kure, a military port near Hiroshima. She must leave her hometown and go with her husband to live with her family in law. All the story consists in the daily life of Suzu in her new home, during these years of war, fear, misery and lack of all kind of goods. The draw art is very simple but beautiful. This work is full of wonderful scenes and pretty drawings. The development of the characters is really good, they all grow and react in different ways. There are many problems they must face including poverty, American air raids and some accidents. It’s very nice how some characters realize many things about each other. My favorite is when Suzu discovered the embarrassing secret of her husband’s past. I really enjoyed this sad story. There were many interesting things and the stressful feeling it gives is amazing. It was also nice the anxiety you have, because you worry about the characters knowing what could happen in the war, but you don’t know until the end, what will happen. It goes without saying that the Second World War had an immense impact on Japanese culture and society. Depictions of the conflict in anime and manga have typically shown the nation’s part in the global event in a sympathetic light, which is in contrast to Western media. The pacifistic attitudes of the new generation of Japanese people comes is justifiable, given the country’s status as the only country to have been attacked with nuclear weapons. Regardless of one’s opinions towards the controversial nature of Japanese involvement in the Second World War, it is hard to deny the horrific nature of these weapons. Following in the the same vein as “Grave of the Fireflies,” “In This Corner of the World” is a manga written and illustrated by Fumiyo Kouno that primarily focuses on the everyday life of civilian and Hiroshima resident Suzu Hojo during the final years of the war. Throughout these years,, a myriad of issues occur, ranging from maintaining relationships with her new family to surviving American bombing raids. It’s a tale that’s rife with conflicts small and large. Suzu is a captivating heroine because of how relatable she is. In spite of the global scale of the war, the manga’s focus on her life creates a sense of intimacy that is oftentimes lost when it comes to depictions of the Second World War. War is never glorified in this story, and aside from inherent pacificistic undertones, there is no political message. This is not a story meant to serve as propaganda or attempt to victimize the Japanese; rather, it is a story about just surviving and living. There is a sense of ongoing tension in the story. Hiroshima’s status as one of the two cities that the nuclear bombs were used on is a fact that is almost universally known. As such, readers are constantly aware that the story will involve this major event in some shape or form. As the story progresses, it is hard to not feel anxious for the diverse cast of characters present. Kouno effectively uses history as a way of driving reader engagement, rather than using it as just an excuse to artificially draw sympathy and empathy from its readers. The story isn’t all doom and gloom, however, as there are light-hearted moments spread throughout. Even amidst the tragedies and obstacles that frequent her life as a result of the war, Suzu and the other characters find moments to smile as well. There are ups and downs in life, and “In This Corner of the World” shows us the human side of a war that is so often glamorized in media. I will mention that there isn’t a particularly strong narrative thread connecting the events in the story. The story is arguably disjointed at points, but it is my opinion that this was intentional on the mangaka’s part. While this style of storytelling is effective at points, there is a lack of closure for some plot elements that are to the manga’s detriment. However, as a whole, Suzu’s tale is cohesive and wraps up well for the most part, although there will be some points that will require reader speculation. Kouno’s art is a strong point in this manga. The art is aesthetically pleasing, although not overly complicated. There is an underappreciated simplicity in her drawing. There are occasional coloured inserts which look like watercolour, which carries on her minimalistic theme. Backgrounds are drawn in a very unique manner, with a mixture of styles that varies depending on context. Even if one did not find the story particularly engaging, it is hard to deny the appeal of Kouno’s illustrations. To conclude, “In This Corner of the World” is a look into the lives of ordinary people who just happen to be caught up in a war. I highly recommend everyone to at least give this manga a shot. I would also like to take the time to say that the anime adaptation of the source material is also absolutely fantastic as well. It is a highly faithful rendition of the story that is on par with the manga.